Simplicity is often the key with developing an idea and the ToneAlly is exactly that - a great practice tool, which we expect will become more commonplace in the future. 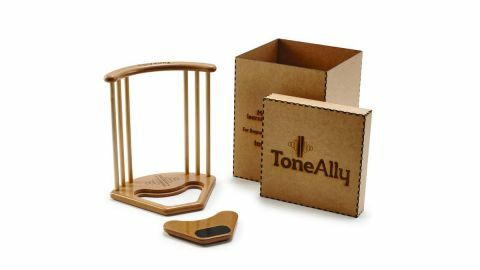 ToneAlly is the brainchild of north-east England based drummer and entrepreneur, Tony McNally. Having been awarded ‘best percussion teaching tool’ at the 2018 NAMM Show, the product also comes with glowing testimonies from high-profile players such as Thomas Lang, Dom Famularo and Craig Blundell. The intriguing wooden practice contraption features a thick base that is rounded at the front, enabling it to fit flush to a 13" or 14" hoop whilst mounted on a snare drum. It can also be secured on a snare stand or simply placed on a tabletop, cushioned by small foam pads on its underside. The base also features a small (80x40mm), 6mm deep neoprene rubber playing surface, which is countersunk into the base. The effect of the neoprene means that it has a less bouncy feel than a regular practice pad and is designed to enable the user to “feel and hear every note”. The concept that makes the ToneAlly completely unique is the use of six vertical dowel rods, which create spaces for drumsticks to be slotted through. These spaces, or ‘alleys’, are positioned precisely to ensure the sticks, and therefore the hands, are located in the correct playing position. The inside alleys are for matched grip players while the outer alleys accommodate traditional grip. The Design 5 model we have on review also features a cut-out section in the base, which can be removed to enable playing directly onto the drum head. The dowels are made from pine, while the rest of the Design 5 is sturdily constructed from a composite wood material and finished with a French polish. The 16mm width of the alleys are barely wider than a standard drumstick (approx 15mm), which completely eliminates any unnecessary side-to-side movement. It takes some getting used to as your sticks are essentially sliding up and down between the dowels. For this reason we found using slightly thinner sticks much more comfortable (and a lot quieter) when practising. Not only was the ToneAlly a stark reality check for myself, a drummer of 20 years, but it proved most useful in the teaching studio with my younger students. It should be a handy training tool for long-term refinement of stick technique.